September, 2014 | H&R Group K.K. The Miya Festival is held annually on the third or fourth Sunday of October in Gamagori, Aichi Prefecture. In 2014, this festival will take place on Sunday, October 26th 2014. Have you ever had a dream that resulted in the people of your town dragging immense mikoshi floats into the sea hundreds of years later? No? Ah, well that’s because you’re not the mayor of a 17th century Japanese town. In 1696 Sazaemon, the mayor of Miya, which is now part of modern day Gamagori in Aichi Prefecture, dreamt that Yatsurugi-Daimyojin, the god of the local Yatsurugi Shrine, upped sticks and moved onto the nearby Wakamiya Shrine by way of a portable mikoshi shrine. Of course, being a pious and important man, he quite sensibly saw this as a message directly from the god itself and instructed the locals to hold a ceremony marking this tremendous occasion. And it’s a good thing that he did as the Miya festival continues to this day as one of the most impressive festivals in Japan. 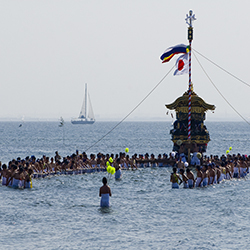 Occurring annually on the third or fourth Sunday of October , four immense dashi floats measuring six metres high (20ft) and weighing 4 tonnes are pulled from Yatsurugi-jinga by 300 loin-clothed men to Wakamiya jinga 1.5km away. Well, that’s how it was originally, anyway. Arduous enough, you would think. However, in 1996 in order to commemorate the festival’s 300 year anniversary this was altered. Now, rather than simply moseying along the streets, they head to the beach to drag a huge mikoshi into the shallow water of Mikawa bay. Once there they follow along the coastline, waist deep in water chanting “Wasoi! Wasoi!” in unison for encouragement all the while, before dragging the sodden floats out of the water and onwards to the latter shrine. It really is a breath-taking spectacle of physical endurance as well as a brilliant representation of tradition, so much so that last year it brought 50,000 people to the coastal town, many arriving early in the morning to bag the best beach spots. So, if you want to see one of the more original and spectacular local festivals, it is advisable to set that Sunday morning alarm early! – Languages spoken: English, Japanese, Korean, Tagalog, Vietnamese (Saturday, once a month, date posted here for current and upcoming month: http://5884-international-clinic.com/tokki/#gaikokujin), Thai (usually available Wednesday, but please call in advance to check). – Dr Tong speaks English. – Doctor speaks English, though the staff may not. – English and Japanese spoken. As a Brit the autumn season always brings with it a palpable excitement for me. Despite the oncoming of the colder months, autumn also brings with it the dawning of the new football (soccer) season; a time when hopes are high and possibilities are seemingly endless (until that first 5-0 thrashing by your local rivals happens, of course). Unfortunately, with the eight and soon to be nine hour time differences between Japan and the UK, unless I want to revert to the sort of sleeping patterns I kept during my university days I don’t often get to watch my team play. However, I have found a way around this by adopting a local team, and it just so happens that in Nagoya we have one of the most famous teams in Japan. Nagoya Grampus were initially formed as Toyota Motor Soccer Club, which later become the Nagoya Grampus Eight currently play in the J League Division 1. The etymology of the team’s name comes from the golden dolphins that adorn the roof of Nagoya castle (there is a genus of dolphin entitled grampus, although the figures atop Nagoya-jo are probably more accurately described as “shachi,” a mythical animal with the head of a tiger and the body of a carp… but I digress). The number eight, whilst no longer making up part of the official team name, can still be found in the club badge and represents Nagoya’s official symbol the maru-hachi, or circle eight, meaning increasing success. Success is not something that Grampus are strangers to. In the year before the opening of the J League, a league in which they have played since its inception in 1993, they achieved something of a coup by signing Gary Lineker from England’s Tottenham Hotspurs. Lineker was a World Cup Golden Boot winner and to this day is the England international team’s all-time second highest goal scorer. Unfortunately his time in Nagoya was plagued by injury, but it paved the way for Grampus to employ an English Manager, Gordon Milne, one time midfielder of the famous all conquering Liverpool side of the 1960’s. However, it was not under Milne, but Arsene Wenger who brought success for Grampus in 1995, winning the Emperor’s cup for the first time in their history following it with a second place finish in the J League the next year, at that time, their highest ever league position. In September 1996 Wenger left Japan to manage English Premier League team Arsenal where he achieved great success winning the league three times and the FA Cup five times. Grampus would win the cup once again in 1999 under the Brazillian manager João Carlos, but the league would not be captured until the arrival of Yugoslavian legend Dragan Stojković. Often compared to Maradonna, Stojković is considered perhaps the greatest Yugoslavian and Serbian footballer of all time, and was expected to become a superstar after a transfer to the French champions Olympique Marseille. However, he surprised the world when after four years in France he joined Grampus in 1994 where he won the cup under Arsene Wenger and was named J League MVP. He remained as a player until 2001, playing 183 times for the Nagoya side. Yet his greatest triumph wearing Barbarian Red was yet to come, not as a player, but as the manager. He coached the team to the AFC Champions League for the first time in 2008, his debut season, before going on to eclipse his mentor Wenger by winning the J League in 2010 and the Super Cup the following year. Stojković retired from Grampus at the end of 2013 to be replaced by current coach Akira Nishino, who has been unable to replicate the success of the Serb. Grampus is currently sitting in mid-table, 11th place in the J League (2014). However, there is still time in the season to cheer Grampus and their Australian star striker Joshua Kennedy before the season closes on November 29. Cheer on the Nagoya Grampus! Home games are split between two stadiums: the Mihuzo Athletic Stadium in Nagoya holds up to 27,000 fans, and the football specific 45,000 seater Toyota Staduim in (yes, you guessed it) Toyota. Seats cost between 2,500 JPY and 7,100 JPY, with kids getting in for as low as 500 JPY, which makes it a great and affordable family day out. Tickets for upcoming games can be bought online from the club shop or from various convenience stores such as Lawson and 7-Eleven. At Ticket Pia, Family Mart, Circle K, & SunKus you can buy tickets using P-code 592-070 and, as games rarely sell out, you can often buy your tickets on the gate. Toyota Stadium is just east of central Toyota, approximately a 15 minutes walk from Meitetsu Toyotashi Station, or via the Tsuramai Subway line from Nagoya. Toyota Stadium is also walking distance, about 17 minutes, from Shin-Toyota Station on the Aichi Loop line. The Mizuho Athletic Stadium is a straightforward 5-minute walk from Mizuhoundojo Higashi Subway Station. Image is the logo of a Japanese football (soccer) club of Nagoya Grampus Eight. Want to take part in a traditional Japanese festival? No matter where in Japan you go, there always seems to be some festival or another going on. They vary in size from gatherings of hundreds of thousands of people to the smallest of local events, and not one of them is alike; except that they are all a marvel to watch. But have you ever considered taking part in one? Many festival participants are restricted by organisation, however some, such as the Katayama Hachiman Jinja Grand Festival in Nagoya, actively seek out all willing participants. The Grand Festival takes place annually in Higashi-ku (near Ozone). This year’s festival and parade takes place on October 26 and they are looking for 150 males and 80 females to take part. ; but, be warned, participation is no light undertaking. The 4km parade passes Ozone Station and Tokugawa Koen, as well as many other local areas, and takes 4 hours to complete. One kilometer an hour, you’re thinking? That doesn’t sound too grueling. However, it is not the distance nor the pace that is the challenge, but the large mikoshi (portable shrine) that you are burdened with. No, this is no cake walk. But then neither is it the brutal chill of February’s Hadaka Matsuri naked festival nor the mortal danger of the Suwa Onbashira log riding festival. In fact, people of all ages take part, however it is recommended that you are in relatively good shape, as lugging the shrine around can be pretty tiring work. So, how do you take part? Well, you can either contact the shrine directly, or if you want to huddle in the safety of other foreigners, you can contact the excellent Kikuko-nagoya.com website (kikukok@hotmail.com) and tag along with them. If you do the latter, they will be meeting at the shrine at 11am, where you will be provided with a hanten Japanese jacket and festival pants called patchi. A shinto ritual will be performed at 12:30, and then off you go. If you are worried about being on your feet for all that time, you will be relieved to hear that there is an hour break at OZ mall at 14:30 for water, a bite to eat and (if other such festivals are a good judge) a glass of sake or two. So, what do you say? Do you want to take part? If so, it is advisable to make contact quickly as the deadline is October 20 2014 ( or until full ). Japanese traditional events are always a spectacle to watch. From the inside, they really are something else.